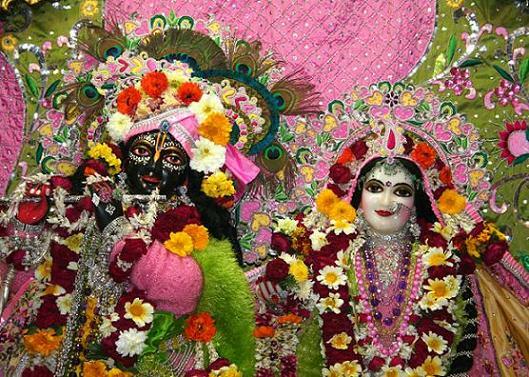 [The spiritual place of transcendental pastimes of Krishna is portrayed in the second verse.] The superexcellent station of Krishna, which is known as Gokula, has thousands of petals and a corolla like that of a lotus sprouted from a part of His infinitary aspect, the whorl of the leaves being the actual abode of Krishna. Gokula, like Goloka, is not a created mundane plane -- unbounded character forms the display of His unlimited potency and His propagating manifestation. Baladeva is the mainstay of that energy. The transcendental entity of Baladeva has two aspects viz., infinite spiritual manifestation and infinite accommodating space for insentient gross things. The uniquadrantal delineation of material universe will be dealt with in the proper place. The triquadrantal extensions of the transcendental infinitary field of the almighty, unlamenting, nonperishing and nonapprehending unlimited situations of halo which are fully spiritual majestic foliation. This very majestical extension portrays the manifested lofty rich feature of the vaster unlimited region or greater atmosphere which has its resplendent location wholly beyond the realm of mundane nature, on the further shore of Viraja surrounded by the halo of Brahman or indistinguishable entity. This majestical power of unlimited spirit emanates on the upper portion of the luminous sphere into the most charming Gokula or eternally existing Goloka, exceedingly beautified by the assorted display of effulgence. Some designate this region as the abode of the Supreme Narayana, or the original fountainhead. Hence Gokula, which is identical with Goloka, is the supreme plane. The same sphere shines as Goloka and Gokula respectively by its upper or transcendental and lower or mundane situation. Sri Sanatana Gosvami has told us as follows in his Brihad-bhagavatamrita which embodies the final essence of all the books of instructions: "He displays His pastimes here in this land as He is used to do in Goloka. The difference between the two planes lies only in their locations as high and low; that is, in other words, Krishna plays exactly the same part in Goloka as He exhibits on the mundane plane of Gokula. There is practically no difference between Gokula and Goloka save that this what exists in the shape of Goloka in the upper region is the same as Gokula on the mundane plane when Krishna showed His various activity there. Sri Jiva Gosvami has also inculcated the same in the Bhagavat-sandarbha of his 'Six Treatises.' " To ascertain the plane of Goloka -- Vrindavana is the eternal abode of Krishna and Goloka and Vrindavana are identically one, and though both are identical, yet Krishna's inconceivable energy has made Goloka the acme of this spiritual kingdom and Gokula of Mathura province forming a part of the mundane plane which is also a manifestation of triquadrantal vibhuti (conducting majesty). Poor human understanding cannot possibly make out how the extensive triquadrantal, which is beyond human comprehension, can be accommodated in the limited nether material universe of a uniquadrantal disclosure. Gokula is a spiritual plane, hence his condescended position in the region of material space, time, etc., is in no way restricted but unlimitedly manifested with his full boundless propriety. But conditioned souls are apt to assert a material conception in regard to Gokula by their miserable senses so as to bring him below the level of their intellect. Though the eye of an observer is impeded by a cloud when gazing at the sun and though the tiny cloud can never really cover the sun, still the clouded vision apparently observes the sun as covered by the cloud. In just the same way the conditioned souls with their obscured intelligence, senses and decisions, accept Gokula as a piece of measurable land. We can see Gokula from Goloka which is eternal. This is also a mystery. The attainment of final beatitude is the success in attaining one's eternal self. The success in identifying the true self is finally achieved when the screen of gross and subtle coils of conditioned souls is removed by the sweet will of Krishna. However, the idea of Goloka is seen to differ from Gokula till the success in unalloyed devotion is achieved. The transcendental plane of infinite spiritual manifestation having thousands of petals and corolla like those of the lotus, is Gokula, the eternal abode of Krishna.